Pirates used axes for chopping down doors of captured ships or to drag rigging out of the way. They used them to cut down nets and sails, and to speed up things related to that. They also used them to quickly dig a hot cannonball out of a ship’s deck before the ship would catch fire. An axe was also a popular tool used to climb up the side of wooden ships so that they could get inside. Cannons were the most popular attacking weapon that a ship had. Larger ships could have up to twelve cannons on board, but smaller ships would have a hard time carrying that many, so having a ship that could hold cannons was highly desired. Cannon balls could not often sink a ship, but they could bring down rigging which would prevent the ship from getting away. The confusion from being attacked by a cannon could also enable the pirates to get on board of their victim ship. The guns that were most popular among pirates were the Musketoon, Flintlock pistol, and a Marksman’s musket. The Musketoon was a short barreled gun that was not a very accurate shot. They were very small though, so it was easy to use in tight spaces and on moving ships in close ranges. The Flintlock pistol was a light gun that was very portable. It was favored for pirates that were boarding ships for this reason. It occasionally misfired though, so pirates either had to bring multiple guns with them, or use it as a club in those cases. And finally a Marksman’s musket was a longer type of musket used by a sharpshooter so that they could easily target the helmsman of other ships. This gun had the best accuracy out of all of the guns popularly used by pirates. Your sword is your best friend as a pirate, so make sure you always have one on you. Choosing the type, or types of swords that best suit you can be the difference between life and death, so be sure to think about this carefully. A cutlass is a short sword that originally started as butcher knives, but can be very nice for hand to hand combat in confined spaces like on a ship deck. The dagger is a very small sword that is easily concealed, making it ideal for surprise attacks. A rapier is a very thin sword that is most ideal for dueling between two pirates, if that is of interest to you. And finally, the long sword is the most deadly with two cutting edges and the longest reach out of all of these swords. 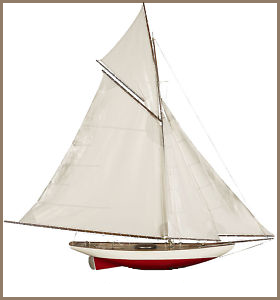 Sloop ships are sailboats with a fore-and-aft rigging and a single mast farther forward than the mast of a cutter. Most modern sailboats are sloop-rigged because they are very aerodynamic and can travel well upwind. 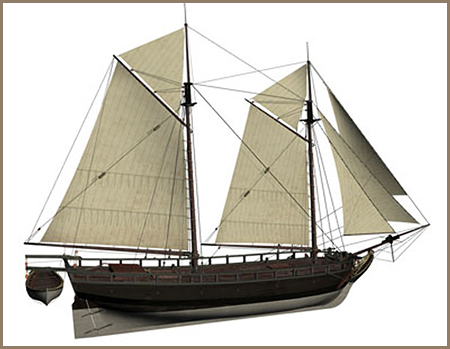 Sloop ships were originally used by merchants because when the ship was made of cedar they were relatively fast ships and could maneuver quickly. It could travel up to 11 knots, while carrying a crew of up to 75 men and 14 mounted cannons. They wanted to use these ships to get away from pirates, which for the most part, just ended up drawing the pirate’s attention to their ships. Pirates liked this ship for its speed as well as the fact that Sloops were well suited for sail in shallow areas. They could sail into shallow areas where those following them, typically naval ships, could not go because their ships were larger and required deeper water to sail without fear of running aground or being completely unable to sail. 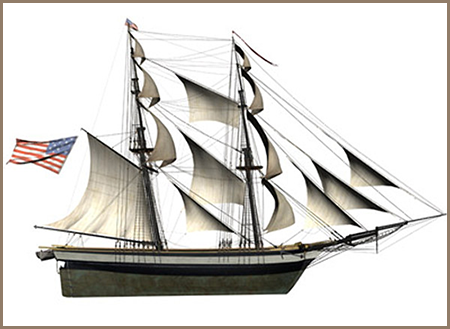 The brigantine was originally a small ship that carried both oars and sails. Mediterranean pirates favored this type of ship where it’s name came from the Italian word brigantino, meaning brigand, and was applied by extension to this ship. 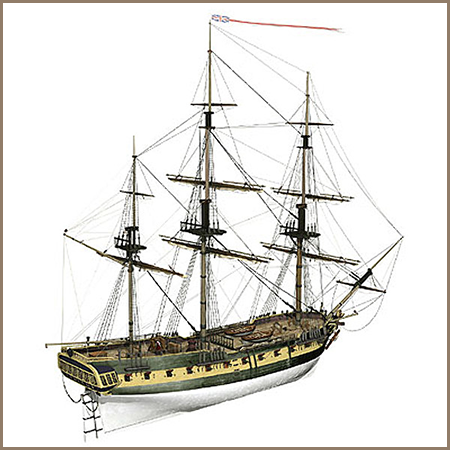 This type of ship was able to mount up to 10 cannons and carry up to one hundred men on board. The schooner was first used by the Dutch in the sixteenth century characterized by the use of a fore-and-aft sails on two or more masts with the forward mast being smaller than the rear masts. Two-masted schooners were the most common for their ability to move at fast speeds and were favored in North America and Northern Europe. This fast ship with a shallow draft was capable of up to 11 knots and could carry 75 crew along with 8 mounted cannons and 4 swivel guns. The frigate is a type of warship that was built for speed and maneuverability. These ships could carry their carriage-mounted guns on a single deck or on two. They were generally too small to stand in the line of battle for navy’s, but were very nice for the ship-on-ship battles that pirates faced. These ships were built up in the eighteenth century to deal with Barbary Coast pirates, which only made them even more prized as a pirate ship. They could carry 24-38 guns on a single deck with three fully rigged masts, making their speed and power highly coveted. 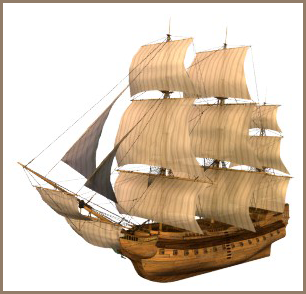 The galleon was a large, multi-decked sailing ship used primarily from the 16th to 18th centuries. This ship was an improvement on old variations of ships as it had an unprecedented level of stability in the water, which reduced wind resistance at the front leading to a faster, more maneuverable vessel. It was longer, lower, and narrower than other ships being around 500 tons heavy. They are around 100-150 feet long, 40-50 feet wide, and can carry about 600 tons. They could have two to three gun decks, making them highly suited for battle. Weaponry and ships that pirates set sail with evolved over time, but making sure that you have the weapons and ship best suited for your needs is essential if you want to make it as a pirate for very long!